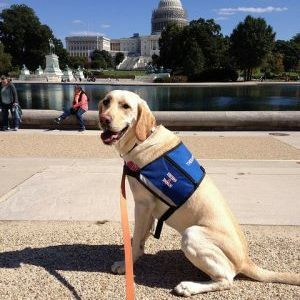 Puppy Raiser: Alison P. & Steve P.
CFC (Combined Federal Campaign) started this month. We first went to an event at the Pentagon. It wasn't part of CFC, but was still wonderful exposure. It was a Mental Health Benefits Fair held to let people know of the resources available. Alison told a lot of people how service dogs help people not only with mobility issues but also to be more social because everyone wants to talk to a person with a dog. Although it was very very hot, people were so nice! We also got to go inside every so often to cool off. Hero Dogs Annie and I rode together to the event. Afterwards, we were so tired. Annie hogged most of the back seat, but that’s okay because I got head pats from Molly. Later in the month I went to the FBI for CFC. Lou was there - he is one of my favorite volunteers. I remember him from last year. I spoke to one of the guys from the canine unit - he helped me find a potty spot outside. I didn't get to meet his dog. He said she wasn't friendly even though I really am. I met lots of people! I think it helped that my friend Jeff works at the FBI. He sent lots of people over to talk to us. 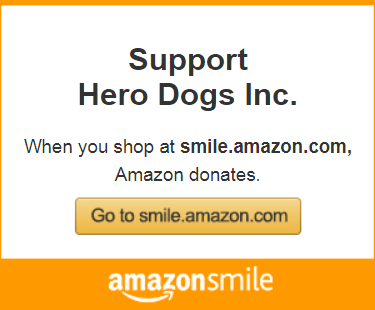 He contributes to Hero Dogs through CFC - he’s one of the good guys. Alison and I went for many walks around Lake Frank. Unfortunately, I wasn’t able to swim in the lake later in the summer because of some strange bacteria. That’s okay because I really enjoyed sniffing all the leaves and dirt. It is a popular park for dog walking - I met many dogs and people. We practice sitting and waiting, which is very hard to do when interesting dogs walk by. I am due to go away to "college" soon. I am not really sure what that means, but I think I will be getting closer to being a “real” service dog! Click here to read Dolley’s full blog.